Portugal Archives - Write for Wine: It's Wine O'Clock Somewhere!Write for Wine: It's Wine O'Clock Somewhere! Continuing on our journey, after writing previously about wines from Argentina and Italy, it was time to taste some Portuguese wines. 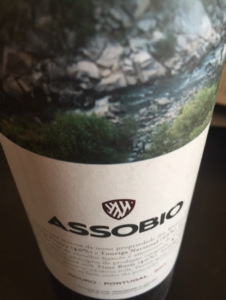 Wines of Portugal kindly sent us some samples to try because we couldn’t make it to their Producer Showcase in Seattle a couple of months ago. This rose´ comes from Vinho Verde in northwest Portugal, and is known because it contains less carbonation than is popular in the region. Medium-bodied, balanced and with a bit of sparkle, you’ll find strawberry and watermelon flavors along with fresh stone fruits and minerals. Think about pairing this distinct offering with fish or shellfish. This dark red wine also has faint aromas of strawberries, but combined with earthy notes, black pepper and cocoa. On the palate, we found notes of black fruit, cedar and dried herbs in a long finish. Well-structured and robust, consider pairing it with grilled meats or spicy beef. A full-bodied red, Follies is deep purple, dense and concentrated with notes of cassis, dark fruit such as cherries and blackberries, spices and chocolate. Drink it with steak, savory beef stew or stinky cheeses. We hope you venture out of your typical wine choices and try some great wines from Portugal.